Where has the year gone? This is my first post of the New Year. The post for the end of January somehow got submerged in the move back to Sturt. I am here for another year. Students have begun new exciting projects. Watch this space as they are completed. Both classes are full with a broad range of weavers from the very experienced to the very new. About this time last year my good friends Kati and John Meek were visiting from Alpena, Michigan, USA. On her return Kati researched and wove a collection of napkins based on the Australian tartan. She has very kindly given them to me. I decided that I’d like to hang some of them in the studio to educate both weavers and any general public passing through. It is amazing how many people do not know that Australia does have an official tartan. 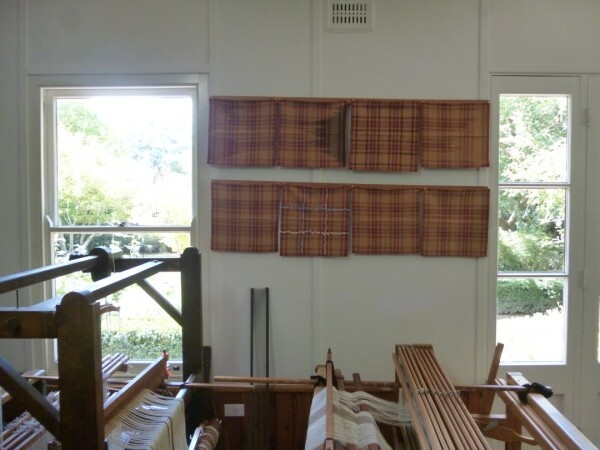 The Australian Tartan was designed by John Reid, a Melbourne architect, as the result of a national competition held by the Scottish Australian Heritage Council to celebrate Australia’s Bicentenary in 1988. 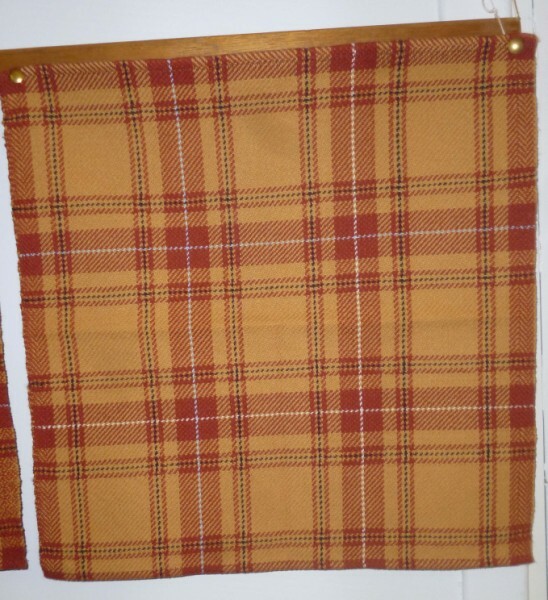 He based his design on the warm colours of the “outback” and the pattern of the tartan of Lachlan Macquarie, who became the second Scottish born Governor of the Australian colony of New South Wales in 1809. The original tartan is lower right. The other napkins are variations of technique and structure. I took time out and went to Canberra to see two wonderful exhibitions: Mapping our World and Gold and the Incas. The promotional leaflet for Gold and the Incas describes the exhibition as featuring “more than 220 works of art including spectacular gold pieces and scintillating jewellery created thousands of years ago to decorate the nobility in life and death.” What is there that appealed to me was not the gold and jewellery but the wonderful textiles. They are superb. Most are very large. Techniques include: tapestry, brocading using supplementary wefts, double cloth and embroidery. A very voluminous loincloth combined plain weave with leno. This very fine textile was extraordinarily beautiful with the leno area being decorated with woven bird motifs. I had come across bird feathers woven into textiles from the Inca culture in other galleries around the world. There are several examples included here. The diversity and richness of the textiles shown here was an unexpected pleasure. The exhibition is on at the National gallery of Australia till 21st April. www.nga.gov.au. This is also a not to be missed exhibition and is on till 10th March. 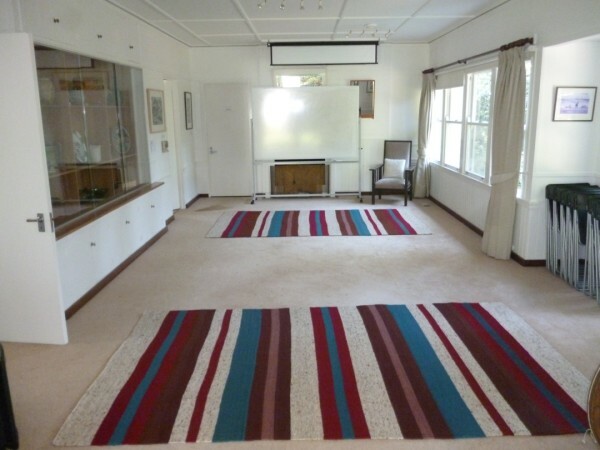 The past few posts have been about The Sturt Community Rugs. Here is the latest update. The rugs have not officially been installed. That will occur when the carpet has been lifted and the floor rennovated. However we at Sturt could not wait to have them in place. The celebration will follow with due ceremony. You are currently browsing the Kay Faulkner's Blog blog archives for March, 2014.